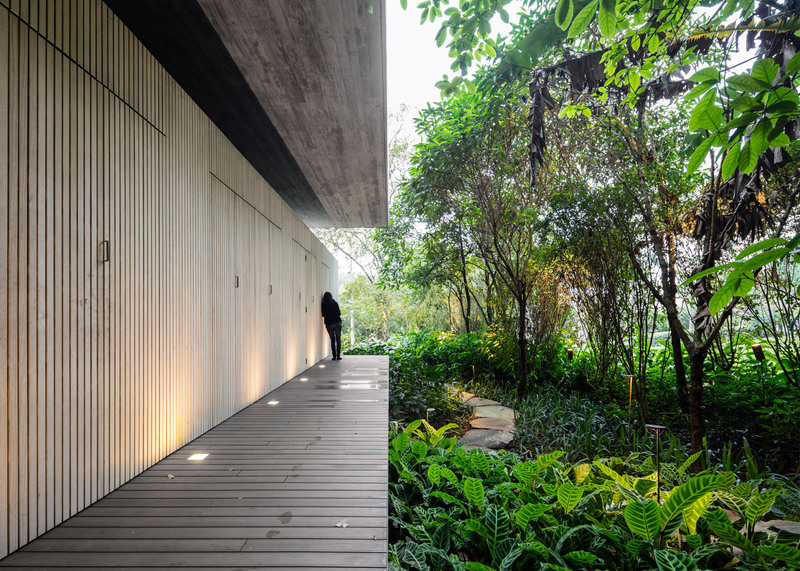 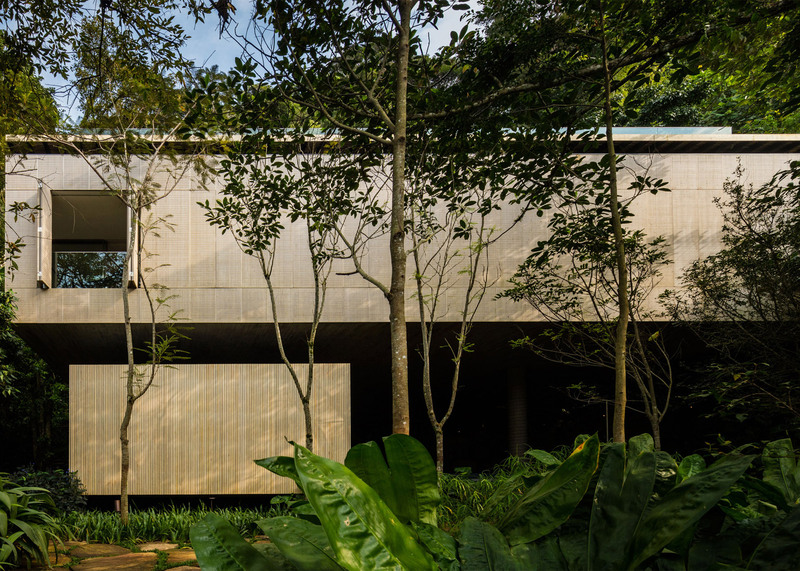 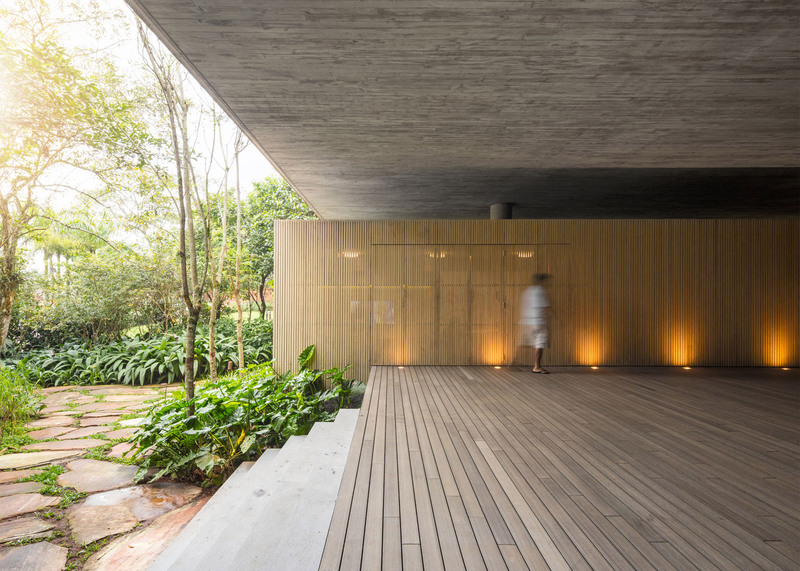 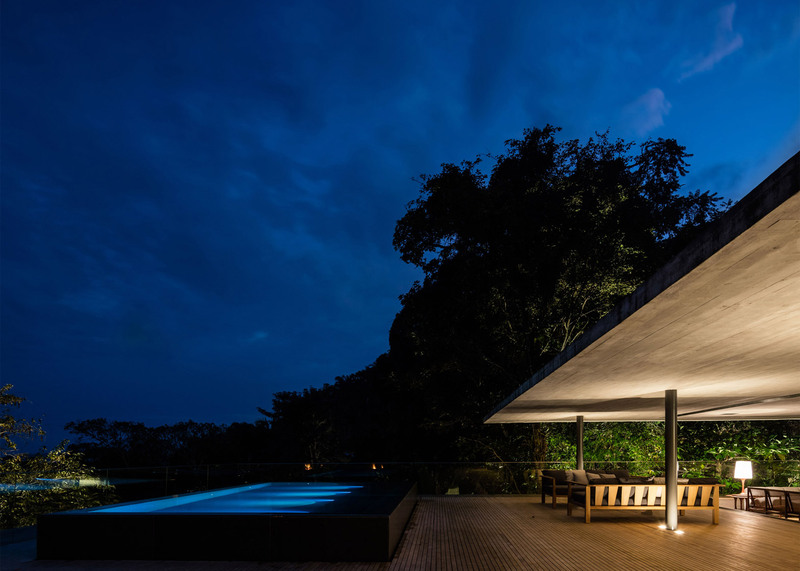 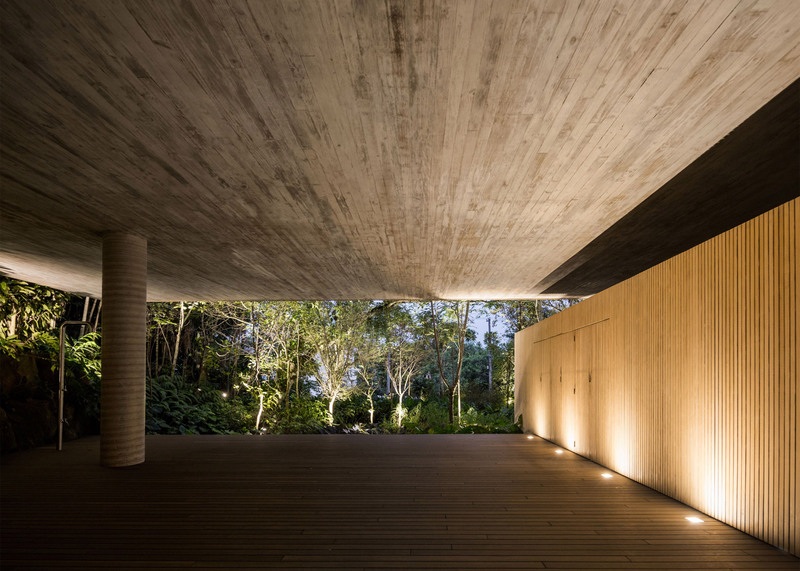 A swimming pool on the roof of this concrete residence by Brazilian office Studio MK27 sits within the dense canopy of a coastal rainforest in São Paulo state (+ slideshow). 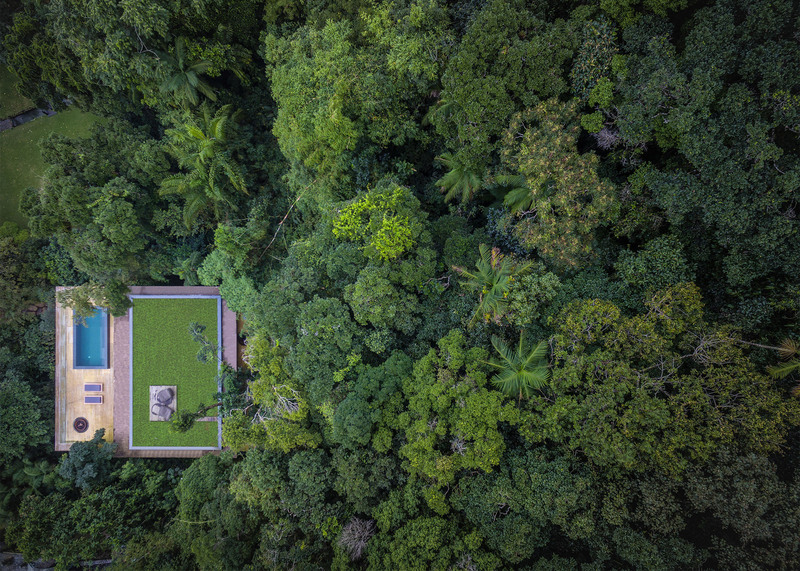 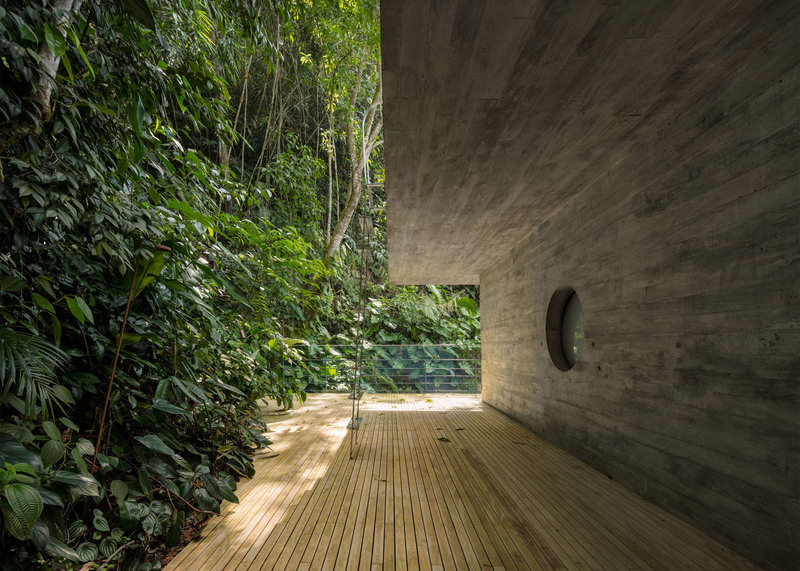 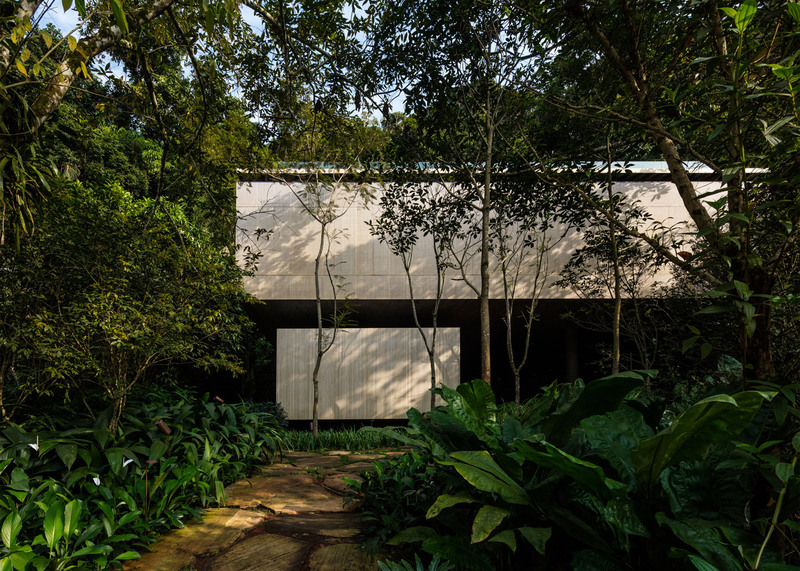 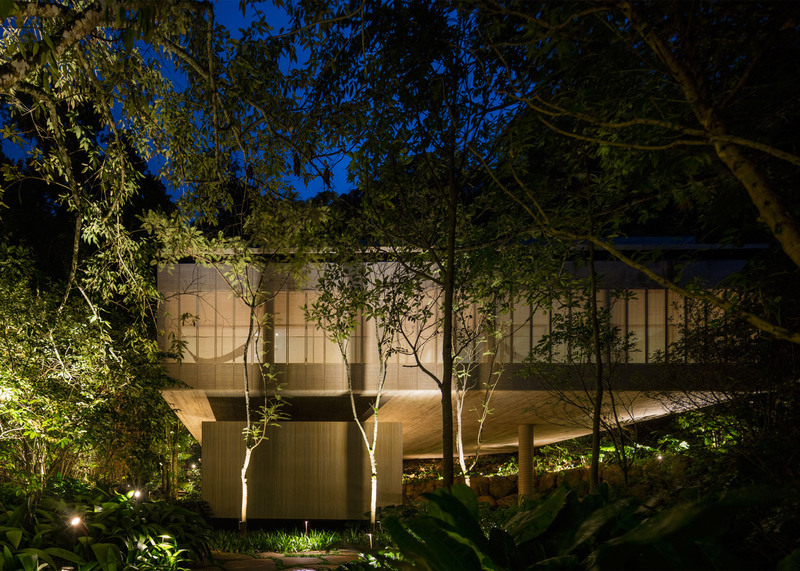 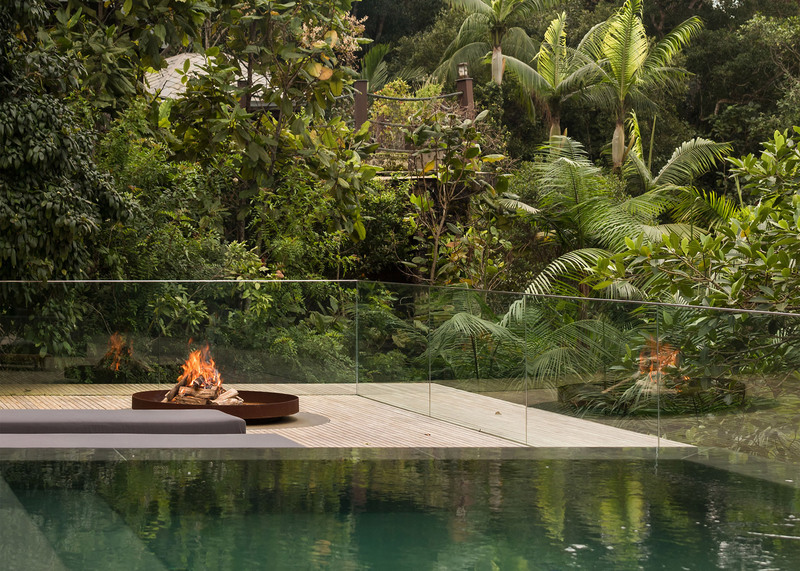 Studio MK27 nestled Jungle House within a clearing in the dense vegetation covering the mountainous terrain of Sao Paulo's coastline. 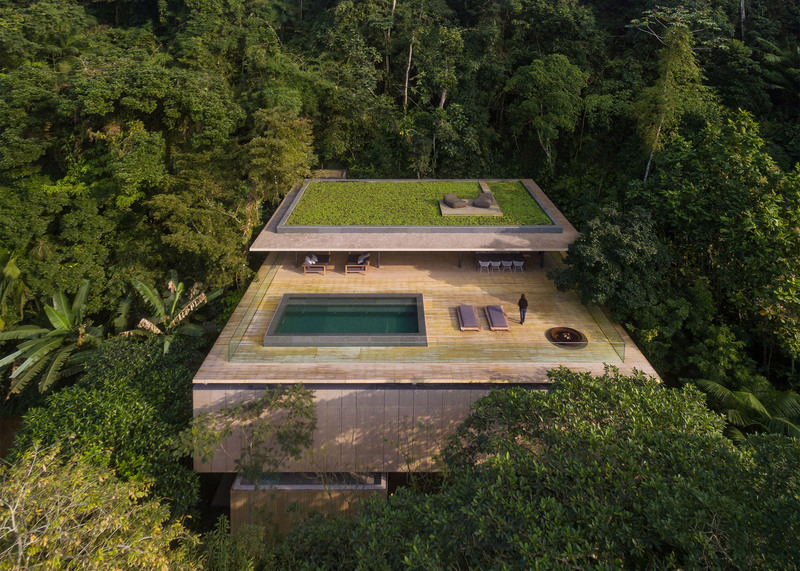 To take full advantage of the scenic landscape, the architects placed the primary living spaces alongside the pool on the building's uppermost floor. 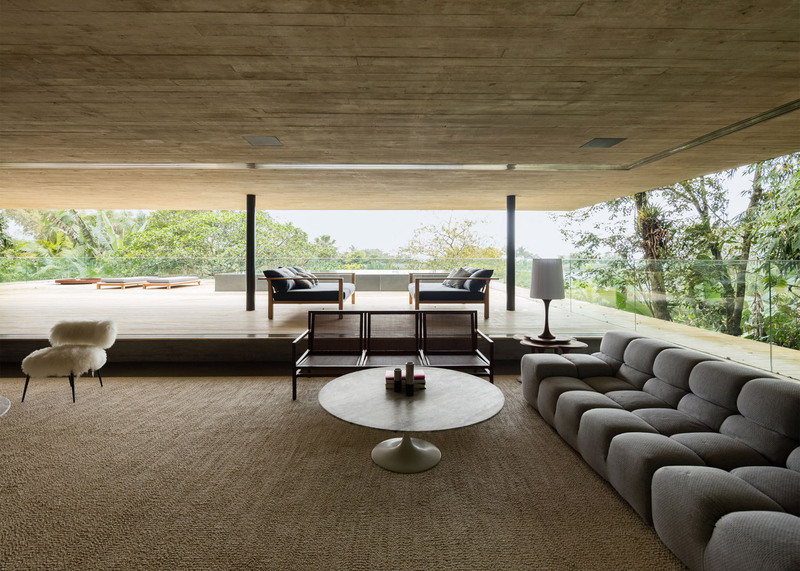 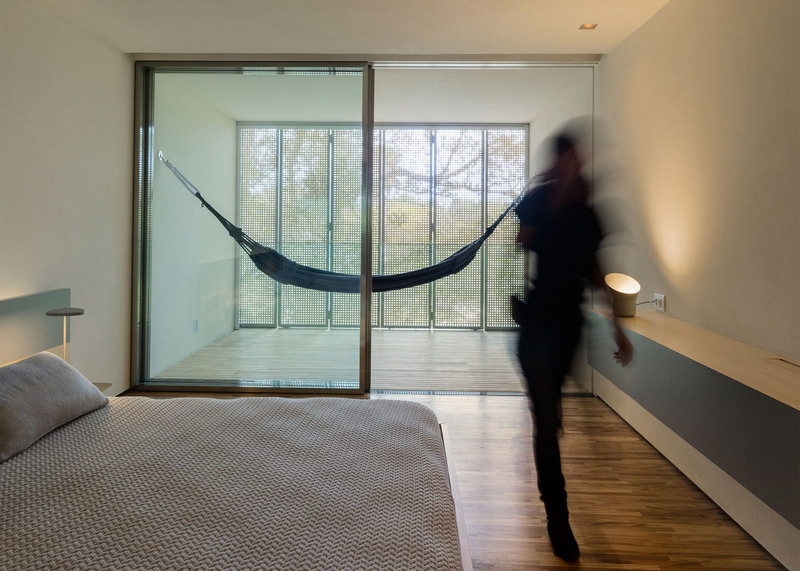 Bedrooms are set within the main volume of the house – a board-marked concrete block that is elevated over a wooden deck, but that rests one end on a stony step in the terrain. 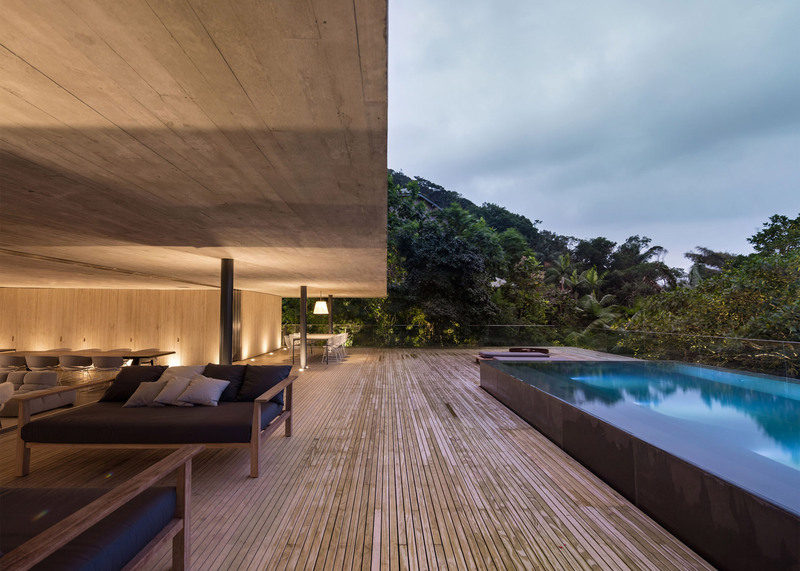 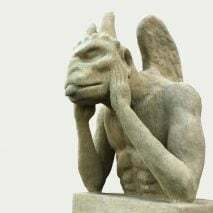 "The introduction of this house to this landscape has the objective of optimising the connection between architecture and nature, privileging the view looking out to the ocean and the incidence of sunlight in the internal spaces," said team, which is led by architect Marcio Kogan. 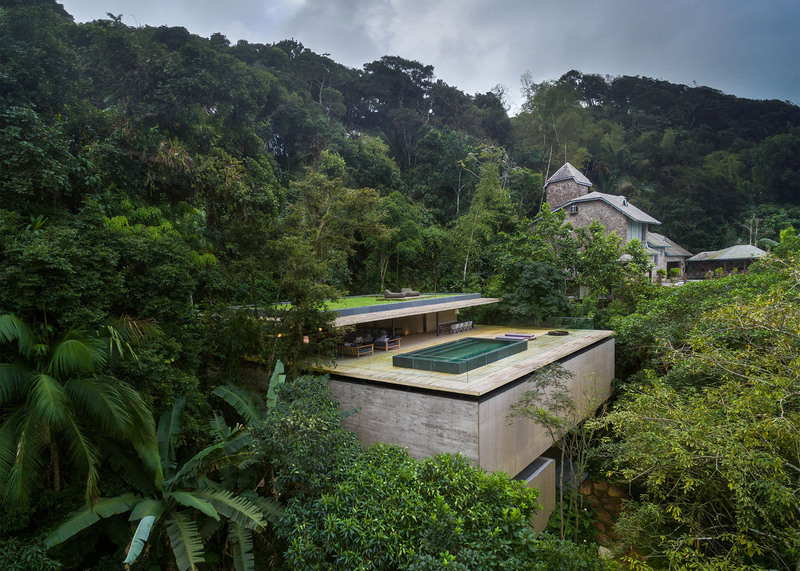 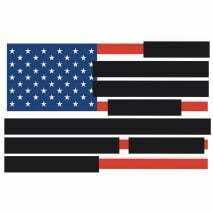 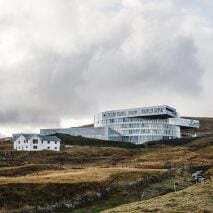 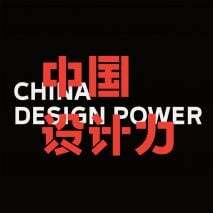 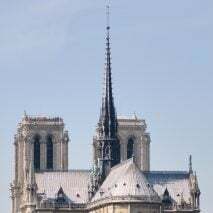 "The house, therefore, projects itself out from the mountain," they added. 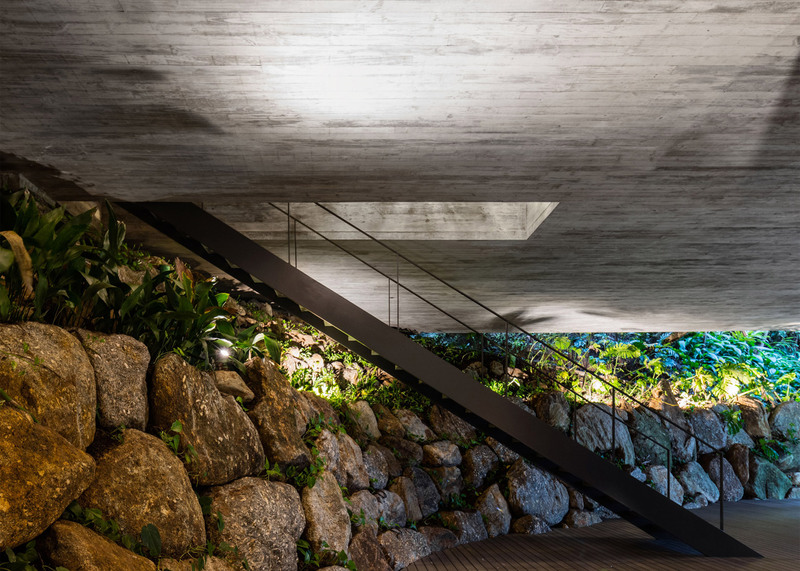 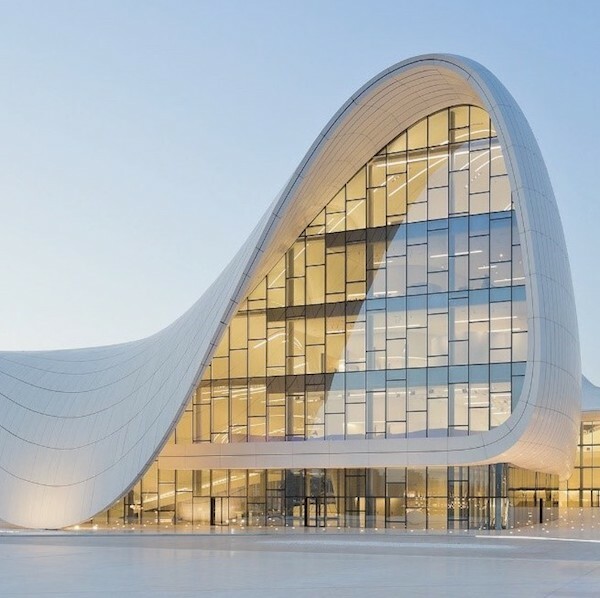 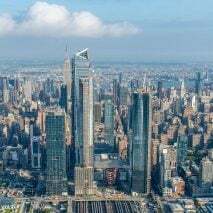 "The contact elements between the slope and the construction were shaped to respect the existing land, thereby creating an organic interaction between nature and the architectural elements." 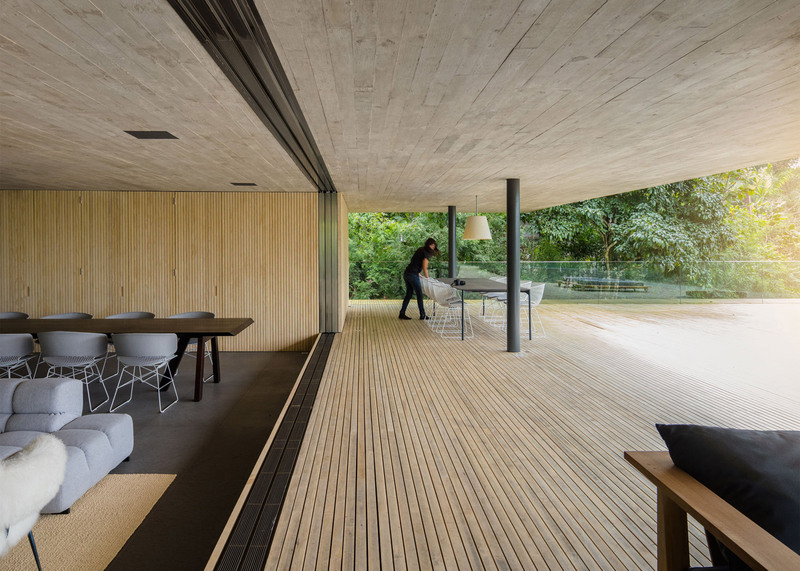 The large wooden deck sheltered beneath the body of the house provides a shaded play area for the family's children, and a small timber-clad block to one side houses an indoor playroom and utility rooms. 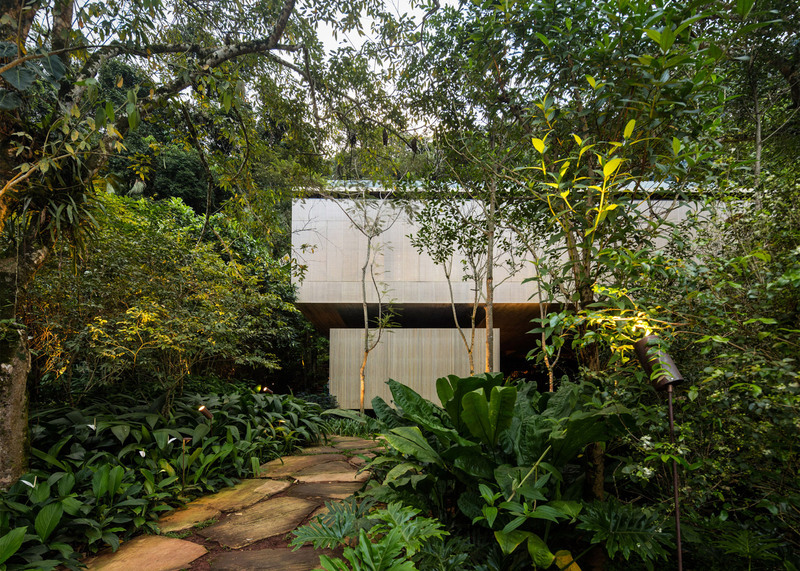 Leafy fronds from the adjacent jungle creep over the edge of the decking, softening its edges, while a flight of steps at the back of the space leads up over a stoney step into the house. 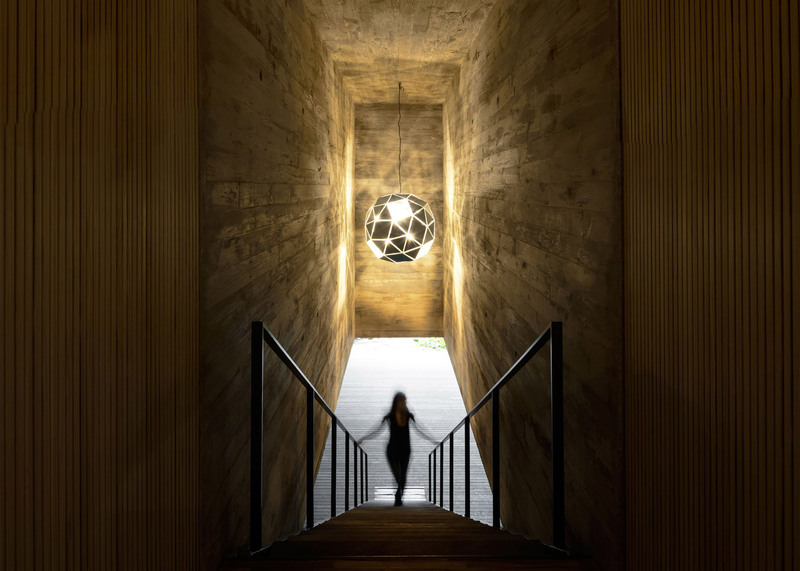 Inside the stairwell, the textured concrete walls are illuminated by an artwork by the Danish-Icelandic artist Olafur Eliasson. 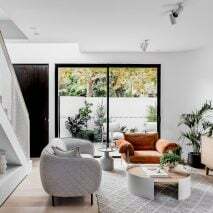 A television room is set at the top of the stairs in the centre of the volume, while six bedrooms with corresponding balconies face into the forest. 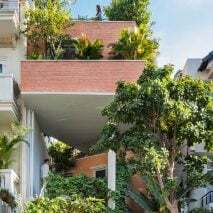 The balconies host hammocks and are shaded from the sun by slatted folding shutters. 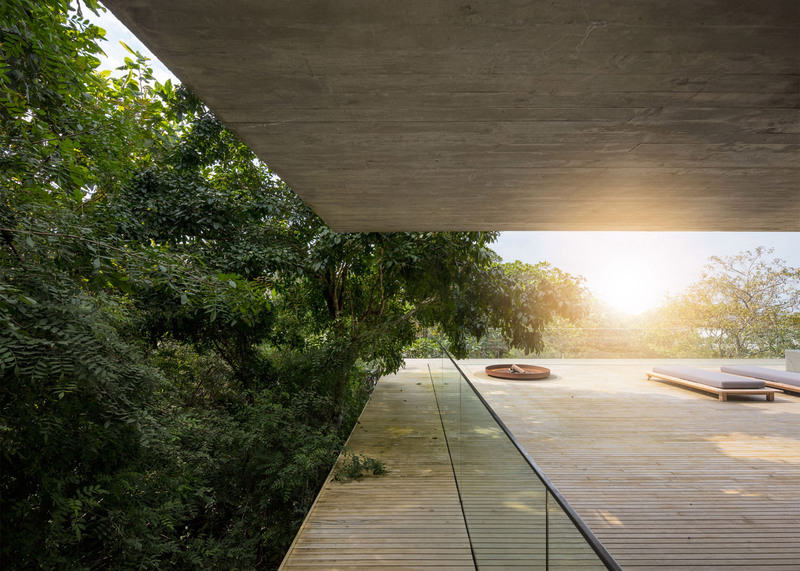 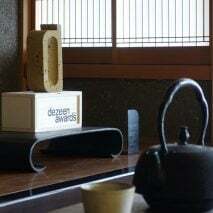 The uppermost floor – a glazed box with an overhanging roof – contains the kitchen, dining room and lounge. 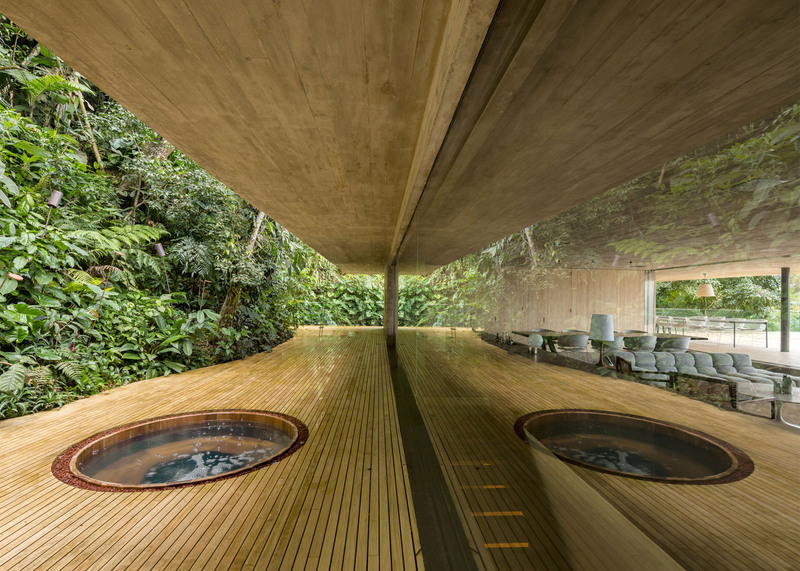 It is surrounded by a patio with a pool on one side and a small circular hot tub on the other. 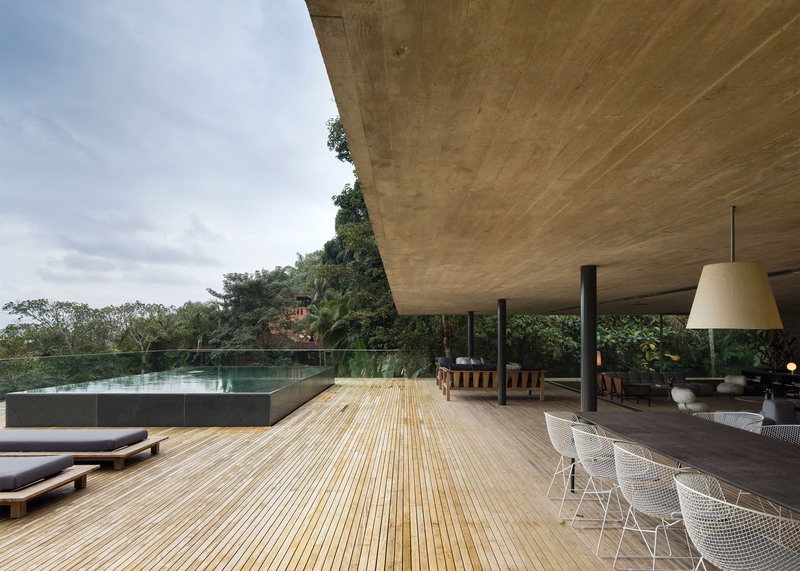 The pool is partially submerged into the floor but has a raised border that brings it slightly above the floor level of the deck. 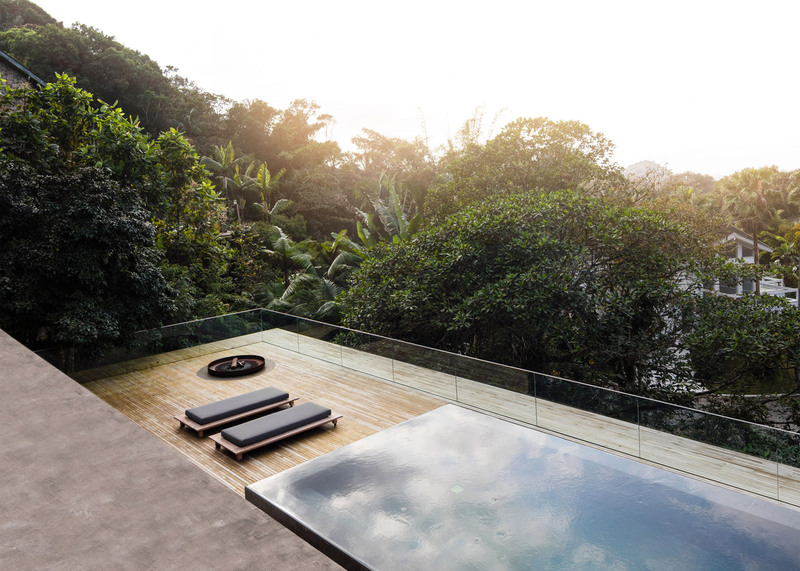 Glass balustrades frame the space, allowing swimmers to enjoy the view. 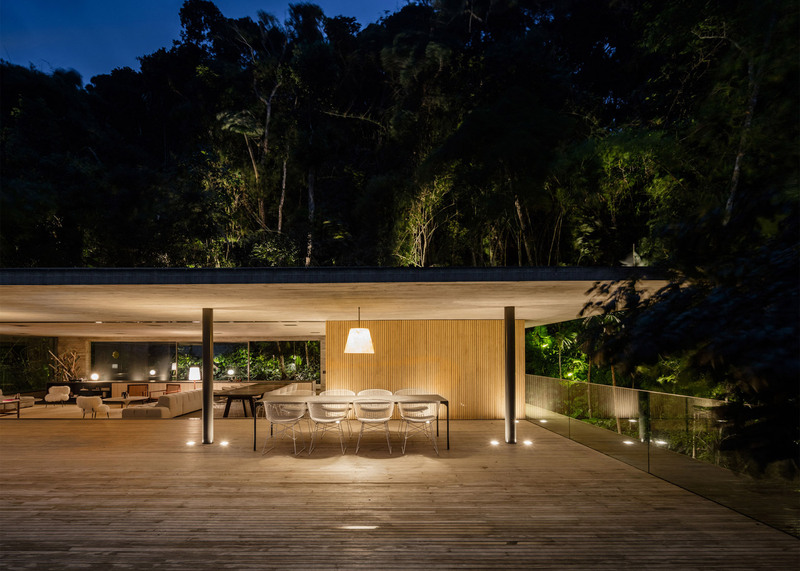 Conversely, the floor of the living area is slightly sunken – by 27 centimetres relative to the deck – to diminish its scale. 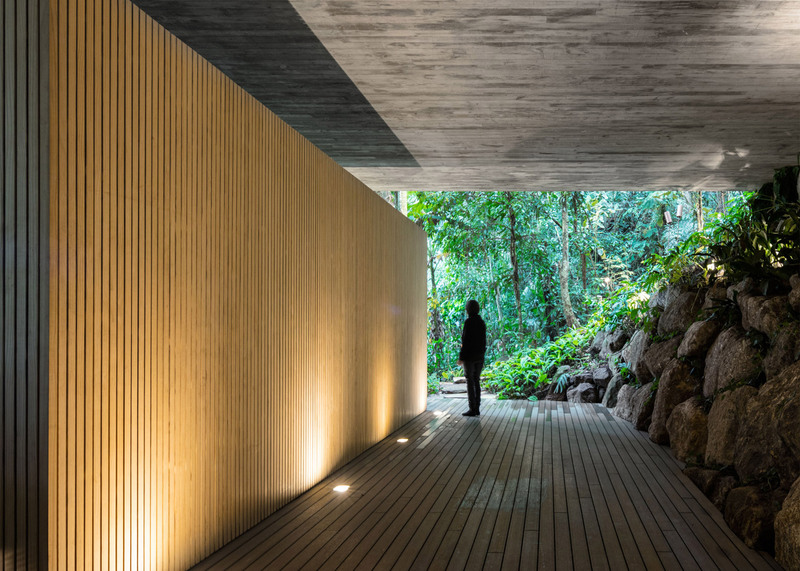 "This last floor offers a spatial sensation which synthesises the principles of the house: on one side, there is a deck which houses the hot tub and the sauna – where there is an intense relation between the architecture and the mountain and its vegetation," said the studio. 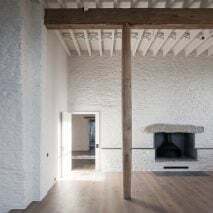 "On the other side, a ground fireplace and the pool; in the centre – between these two free spaces – is the living room open to both sides and with cross-ventilation." 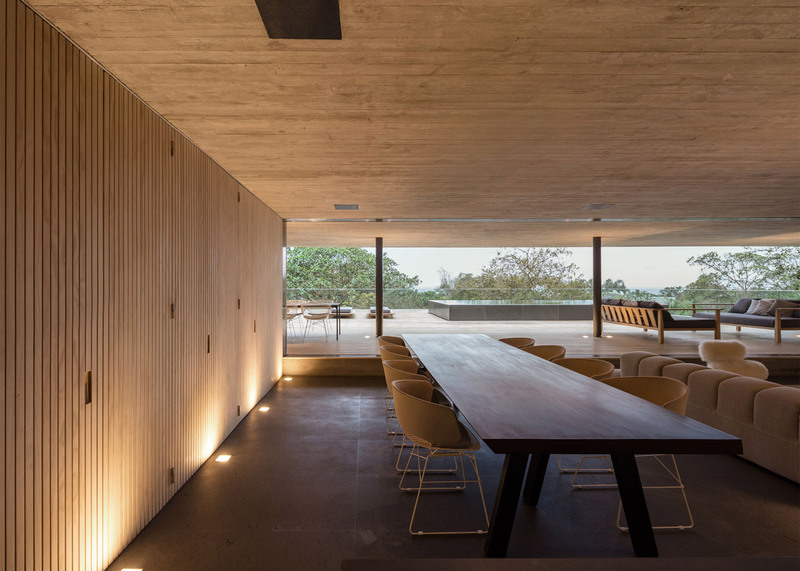 The building's raw concrete and timber construction is left exposed across the interiors, which are finished with neutral-coloured furnishings in a variety of textures. 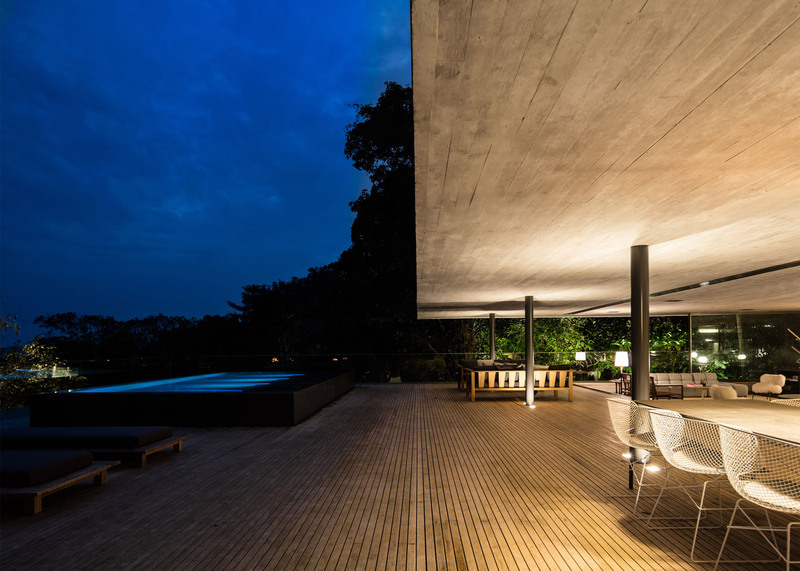 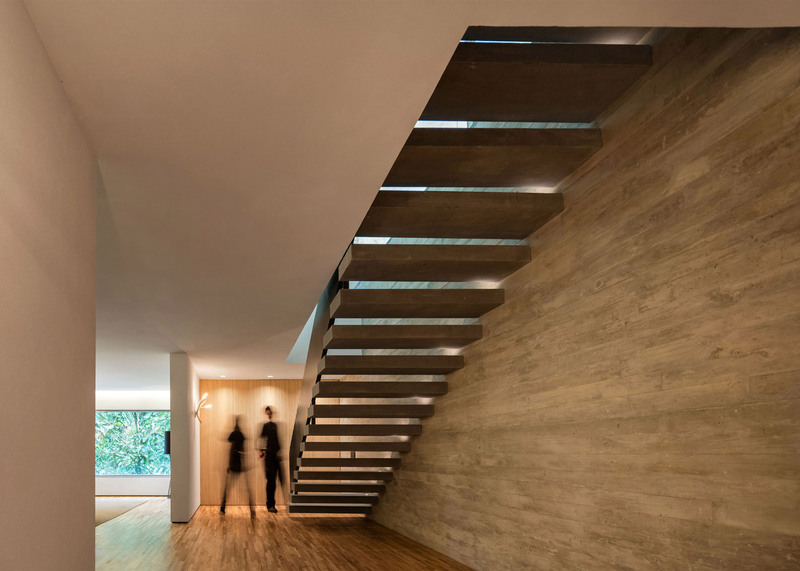 Marcio Kogan founded Studio MK27 in São Paulo in the 1980s and now has a team of almost 30 architects. 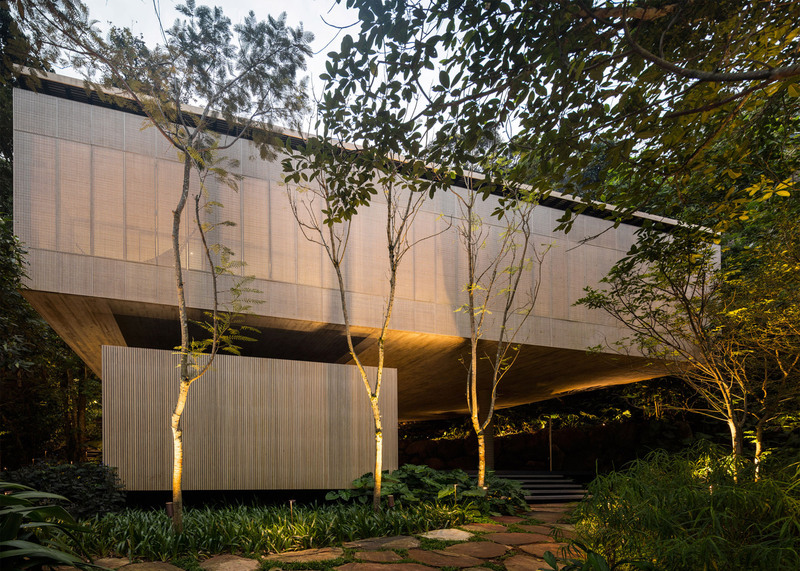 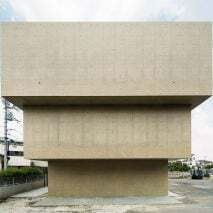 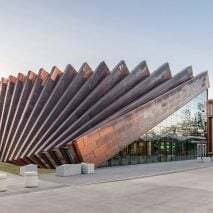 Recent projects include a book shop with a vast timber-lined reading room, a concrete photography studio with folding walls and a 65-metre-long house.